« The Bear Market. Depressed banking stocks dragging indexes lower. As global stock markets are now entering into bear market territory (20% drop in all indexes), it is wise for a investor, consumer or anyone that follows the markets and is concerned about a prolonged economic recession; should now look at a depressed banking sector, the terrible shape it is in and it’s inability to function in a collapsing market (housing in the US, UK, Spain, Ireland, also now Japan, Australia and New Zealand). The current US banking sector is in a shocking disposition, it is by all definition contracting rapidly; that is it’s assets are losing value and their balance sheets, capital pools are shrinking. The Federal Reserve under Ben Bernanke has clearly indicated recently that the Fed would extend it’s lending and bail out policy to not only retail banks but also Wall Street investment banks as well. 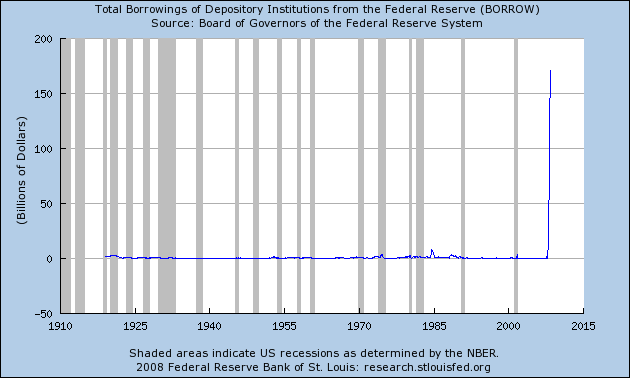 Refer to graph of total borrowings of US banks from the Federal Reserve bank – the graph is self explanatory of the amount of money the Fed has lent out to US banks, to essentially bail them out. Of course this means the Fed will print more money, which they can do ad infinitum, thus depreciating the already weakening US dollar. The arrogance of the Fed under Ben Bernanke is that despite already high inflation, the US consumer in someways will adjust to a money printer policy of bailing out banks; in this case the extremely irresponsible and risk obsessed investment banks. I don’t think the markets care if another bank is bailed out or not, the main concern is now inflation that is eroding consumer confidence and corporate defaults, job losses; but the markets (current bear stock market conditions) is also clearly concerned that and ailing banking industry is afraid to reinvest bank into an recessionary economy. (refer to The Bear Market. Depressed banking stocks dragging indexes lower.) So businesses that were and are still highly leveraged are also going to contract, as they will find it hard to refinance debt, raise capital and function in a slowing and inflated (oil, food) economic environments (stagflation) economy. This of course contributes to the fear in the credit markets of continue credit defaults, noted in the Itraxx crossover index for 5 yr European investment grade debt, now sitting at 101 EUR. The increasing amount to buy or insure investment debt, is an indication of the high risk of corporate bonds. Simply the Itraxx measures risk in the debt markets of company defaults, the higher the Itraxx, the more risk the market has factored in for bond downgrades and credit defaults. It appears to be a global synchronized bear market (stocks), the lack of confidence in the global markets could also be indicative of the rising fear of company defaults. The question is could we see a rise in business defaults on a global (synchronized) scale? If America is to fall into a severe recession (depression), undoubtedly this will drag most of the world into a depressed economy. “Fannie Mae and Freddie Mac are government sponsored enterprises that help the mortgage market function by purchasing pools of loans and packaging them into securities. If one or both couldn’t function, the result would be chaos. At the end of last year, Fannie alone had packaged and guaranteed about $2.8 trillion worth of mortgages, approximately 23% of all outstanding US mortgage debt. And these securities are highly rated and sold to investors all over the world. “So what would force the Treasury and Fed to step in? Fannie and Freddie are among the most highly-leveraged companies around, meaning the amount of capital they have on hand is nowhere close to the level of assets they control. Fannie and Freddie must constantly borrow money in order to operate; if for any reason borrowing costs rose sharply they would not be able to make good on their guarantees or even fund their day to day operations. This is when the government would feel intense pressure to step in and, at the very least, pay contracts in a timely manner. This entry was posted on July 10, 2008 at 12:51 am	and is filed under Finance and Economics. Strategy and Society. Tagged: bank bailouts, depression. You can follow any responses to this entry through the RSS 2.0 feed. You can leave a response, or trackback from your own site. Excellent post. I was checking constantly this weblog and I’m inspired! Very helpful info specifically the closing phase 🙂 I care for such information much. I was looking for this certain information for a long time. Thank you and good luck.